Treyarch released the Black Ops 3 1.5 Patch a little earlier than expected, proving everyone that they're still on top of their game. 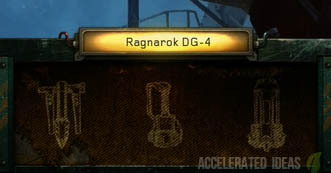 Consequently the new Wonder Weapon called the Ragnarok DG-4 was revealed along with several related Trophies. 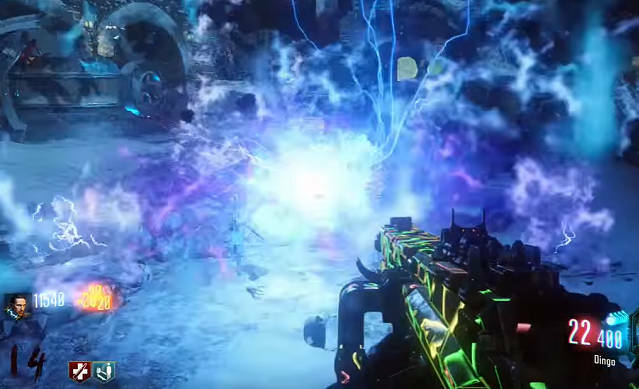 In this post you'll find details explaining exactly how to get this new weapon in Der Eisendrache. 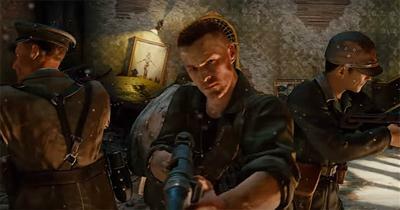 Although the name resembles the classic Wunderwaffe DG-2 electric weapon (from World at War) the DG-4 is both a deployable weapon (like a turret) AND also an electric power slam, similar to Gravity Spikes from multiplayer. It does however stay true to the electric attack that we come to expect from a DG-X weapon. As long time fans will know, the original DG-2 weapon made it's first appearance in Shi No Numa, the Japanese swamp map which was the second DLC zombies map for World at War. We're told that the Wunderwaffe was part of the secret Nazi technology that originated in Der Riese along with the teleporters. The weapon later made a return in Der Riese, then Call of the Dead before finally making a re-appearance in Black Ops 3 via The Giant map. In the early maps the weapon had extreme power, helping players reach very high rounds in Shi No Numa. Unfortunately, the weapons power was later reduced in scale in The Giant. The DG-4 is a buildable weapon, proven by the screenshot above. Players require 3 parts to complete the weapon build at a workbench. The other buildable item is the Rocket Shield. The first part for the weapon is actually the hardest to acquire, simply because of timing. Use the teleporter, not far from the pyramid room, to teleport to the Rocket Launch site. Wait around 2 minutes for the countdown timer to start. As soon as the countdown begins, sprint up to the control panel just under the Pack a Punch location, near the stairs. Interact by pressing Square and the light will change from red to green. Now go back to the teleporter area and wait for the lights to all turn green on the control panel. Interact with the controls and the first part for the DG-4 will appear inside the teleporter. The second part for the weapon is only accessible when using the launch pads and there's a process to follow as well. First, make sure you have activated the landing pad over by the Bell Tower, near the Death Ray machine. Then use the Death Ray and wait for it to complete. Look up in the sky and you'll see the second part floating. Now use the launch pad on the opposite site to fling yourself over, catch the part and land by the Bell Tower. The image above outlines the process. The big arrow is pointing directly at the part, whilst the thinner arrow shows the trajectory you need to take to reach it. Starting from the launch pad on the left and landing by the Bell Tower on the right. The third part for the DG-4 is dropped by the Panzersoldat when he dies. It's the usual brightly coloured blue item so you won't miss it. The Panzersoldat usually appears around round 12 and the easiest way to kill him is with the Bow Wonder Weapon or by using an automatic weapon and aiming for his head. What does the Ragnarok DG-4 do? As mentioned above the weapon has two forms of attack. You can either throw down one of the components to create an electric turret/trap that kills zombies in close proximity. Or, you can use the traditional Gravity Spikes power slam attack, which knocks enemies off their feet sending them up into the air. What I love the most about this weapon is the fact that it recharges as you kill zombies. No need to wait for the round to end or a max ammo drop! Along with Patch 1.5 a list of Trophies were revealed, two of which reference the new DG-4 weapon. 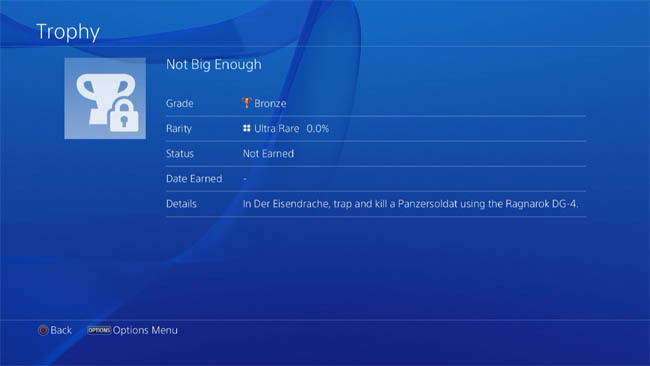 The in-game Trophy/Achievement called "Not Big Enough" challenges players to trap and kill a Panzersoldat using the DG-4 weapon. To achieve this players need to deploy the DG-4 in it's turret/trap mode and then finish him off with a lethal dose of electricity via the DG-4 or other high powered weapon. This trophy is not an easy feat because the Panzersoldat now has a stun grenade attack rather than a claw, this disorientates you and inflicts lasting damage. Interestingly there's also a second Trophy/Achievement that relates to the Ragnarok DG-4. Players can earn the "Time to Slam" trophy by reviving other teammates whilst the DG-4 is protecting them. This simply requires you to use the DG-4 in it's deployable form, killing nearby zombies while you revive any downed teammates. Obvious this is NOT a solo trophy.